Ben and Colin (me) built a prototype Record Breaker in about 1982. It is a classic Chester Lanzo design from 1938 and Ben actually tracked down and spoke to Chet about the design and we sent him a picture and flying report when it was finished. We built the model together as Ben was drawing the plans up. 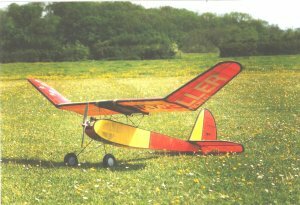 The last I heard was that the same model was still flying as a club model on which anyone could have a go up at the White Horse club. The Record Breaker, as the name suggests broke many records back in the late 1930's and it's huge wing area and light structure mean that it really wants to go up and stay up. If you want a high flying model that is big enough to see at altitude and nice n easy to fly then a Record Breaker is a good choice. The kit features a 2 piece wing for ease of transport and comes with pre cut balsa and ply wing and tail ribs, formers strip and sheet wood undercarriage wire, hardware and full size plans. Everything for the basic airframe of the model.